How do I use the Catalog dashboard? After you log in to catalog, the catalog dashboard displays your enrolled courses by status. You can also access the catalog listings to enroll in additional courses or programs. After you log in to catalog, you can view your dashboard. On your dashboard you can access the user menu  and view your enrolled courses . The user menu appears on every catalog page. 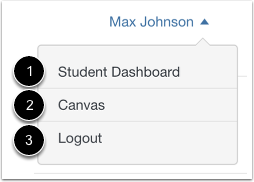 In the user menu, you can view your enrolled courses via the catalog student dashboard , view your Canvas account , and log out of your catalog account . Courses and programs are shown according to their related status. By default, the dashboard displays the In Progress tab. The In Progress tab displays enrolled courses and programs that are in progress, or courses and programs that have not yet started. The tab displays two types of sections: Courses and Programs. In Progress listings are organized by the percentage remaining for a course or program, followed by title. If no listings are currently in progress, all listings are organized by title. Note: If you can't view a course that hasn't started yet, your institution has restricted you from viewing upcoming courses. The Courses section shows all courses that are available to you. Each course displays the course name , the length of the course , and the course description . If a course includes credit, you can also view the number of credits offered for the course . If a certificate is available, the course displays the name of the certificate . If a course is available to you, you will be able to begin the course . If a course is not yet available, either by course date or because the course has not been published by your institution, you cannot begin the course. The course image will also display a lock icon . If you want to drop a course or program, click the respective Settings icon . Catalog listings determine course completion on course modules, which create an organizational structure for the course. If a course requires modules to be completed in order, the listing displays a course progress bar with a percentage of completion. If a course does not require modules to be completed in order, the listing does not display a progress bar. Note: If your course is not designed with modules, the Begin Course button will be replaced with a Go to Course button. If you begin a course and do not finish it right away, the dashboard button will display as the Resume Course button. If you are enrolled in a program, the In Progress tab displays sections for both programs and sections, with programs listed first. The Programs section displays all details of your program(s). Like courses, each program displays the program name , the length of the program (if set) , and the program description . If a program includes credit , the number is the cumulative of all courses offered in the program. If a certificate is available, the course displays the name of the certificate . In the Requirements list, you can view all the courses that are part of the program. You can click the Requirements heading to show and hide course requirements. If a program has a course that is available to you, you will be able to begin the course . 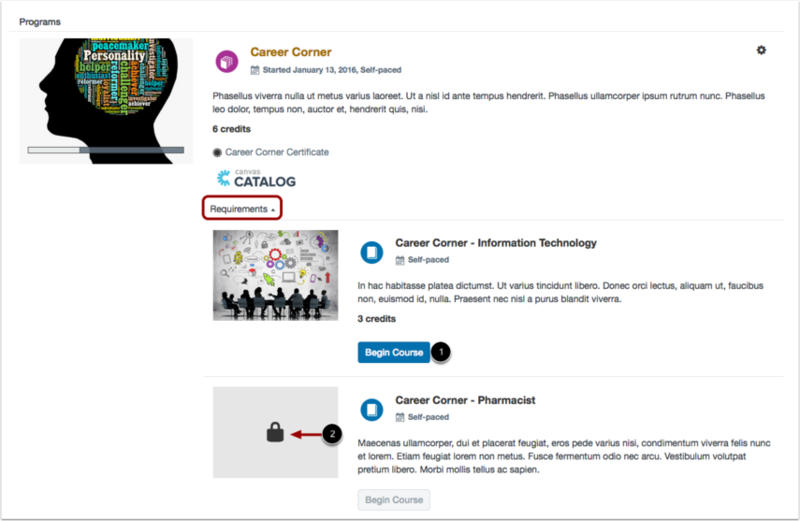 Again, if you begin a course and do not finish it right away, when you return to the dashboard the button will display as the Resume Course button. If a course is not yet available, either by course date or because the course has not been published by your institution, you cannot begin the course. The course image will display a lock icon . Note: If all courses in the Requirements list include a Begin Course button, you can complete the courses in any order. The Completed tab displays courses that have been completed. Completed listings are organized by the time the listing was completed, followed by title. You can view the date that the course or program was completed . If your course or program offers a certificate of completion and you completed the course before the deadline (if applicable), you can also view the certificate . You can also review the course at any time . The Not Completed tab displays courses that have expired. Completed listings are organized by the time the listing expired, followed by title. You can view the date that the course or program expired . If you have added your name to a wait list, the Wait List tab shows those listings directly from the Dashboard. You can view the name of the course or program and the status . If a spot becomes available, the course or program will move to the In Progress tab. To remove your name from the wait list at any time, click the Remove icon . To view a transcript of all your current and concluded programs and courses, click the PDF Transcript link. The transcript shows all enrollment information as displayed in your In Progress and Completed Catalog tabs. To access your institution's catalog at any time, click your institution's logo  or, in the footer of the browser window, click the Course Catalog link . Previous Topic:How do I log in to my catalog account? Next Topic:How do I begin a catalog course or program? Table of Contents > All Users > How do I use the Catalog dashboard?